It's been very windy recently. Two ridge tiles blew off our next door neighbours roof and landed on top of our dorma window last Friday. 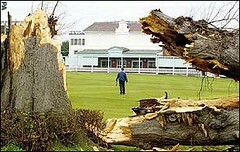 At the weekend Canterbury Cricket Ground's famous Lime Tree (pictured) was blown down. The cricket ground was built around the tree in 1847 and the tree was over 200 years old but was dying and becoming very weak. Kent have a different type of stump problem now though working out what to do with the remains of it. More sad news was announced this week that Charlie has left boy band Busted resulting in the split of hugely popular band. I went to a Malaysian Barbeque restaurant last Friday with most of the Halifax people I still know that were around. This was in Sowerby Bridge and on my only other visit to Sowerby Bridge on the way home I remember hearing Steps had split up. That was Boxing Day 2000 I think. Hmmm the weird things you remember. Another change i'm getting used to is being back to work after the enjoyable Christmas break. So that's the sad changes. The only good change I can think of at the time of writing is that Carmella played by Natalie Blair is back in Neighbours.